The Championships Day 2 results will be known shortly and you can stay up to date with all the news at horseracing.com.au. The appearance of Winx in the Queen Elizabeth Stakes is the obvious highlight, but this is a race card that is absolutely packed full of quality. The Sydney Cup, Australian Oaks and Queen Of The Turf Stakes are all outstanding betting races and you can find excellent odds for every single race with [ladbrokes]. Don’t miss out on an outstanding day of racing – keep coming back to horseracing.com.au for all the results! Futooh could back-up in the Champagne Stakes at Royal Randwick next weekend after he recorded an impressive win in the China Horse Club Mile at Royal Randwick this afternoon. Jockey Jason Collett timed his run to perfection on Futooh and she was able to finish over the top of stablemate Muswellbrook in the concluding stages of the race. Don’t miss out on top odds for all the races at Royal Randwick this afternoon with [ladbrokes]! California Turbo stormed home late to record an impressive win in the South Pacific Classic at Royal Randwick this afternoon. The two favourites Isaurian and Renewal took each other on early and that set things up for the swoopers. It was California Turbo that stormed down the outside in the final 200 metres and he held-off a flying Dark Dream to record a smart win. Pure Elation showed a lovely turn-of-foot to record a classy win in the Percy Sykes Stakes at Royal Randwick this afternoon. Michael Walker gave Pure Elation a lovely run in transit and the talented filly responded strongly when she was asked for an extra turn-of-foot. Co-trainer Peter Snowden was delighted to see Pure Elation recorded a maiden black-type win and he believes that the daughter of Fastnet Rock still has plenty of upside left in her. Serene Miss will head to Queensland for a 2018 Brisbane Winter Racing Carnival campaign after she recorded an outstanding win in the Provincial Championship Final at Royal Randwick this afternoon. Jason Collett elected to settle Serene Miss in the second half of the field, but she tracked into the race very nicely and quickly finished over the top of her rivals when she was asked for an extra effort. Serene Miss has now recorded six wins from seven race starts and trainer Kris Lees is confident that she is up to black-type level. Catchy stormed down the outside of the Royal Randwick track to return to winning form in the Arrowfield Sprint this afternoon. Jockey Joao Moreira elected to settle Catchy at the tail of the field and it proved to be a winning move as the talented filly showed an excellent turn-of-foot to finish over the top of her rivals. Co-trainer David Hayes confirmed that Catchy will now head to Adelaide for the Robert Sangster Stakes. Unforgotten ran down a gallant Hiyaam to record an excellent win in the 2018 Australian Oaks at Royal Randwick this afternoon. Michael Dee took Hiyaam straight to the front and she was able to turn the race into a genuine staying contest. Hiyaam gave a kick at the top of the straight, but Unforgotten stormed home in the final stages to score a scintillating win. Winx showed her trademark turn-of-foot to record her 25th straight win in the 2018 Queen Elizabeth Stakes at Royal Randwick this afternoon. Gailo Chop took up the running in the early stages of the Queen Elizabeth Stakes and got a very easy run in front, while Hugh Bowman elected to settle Winx at the tail of the field. 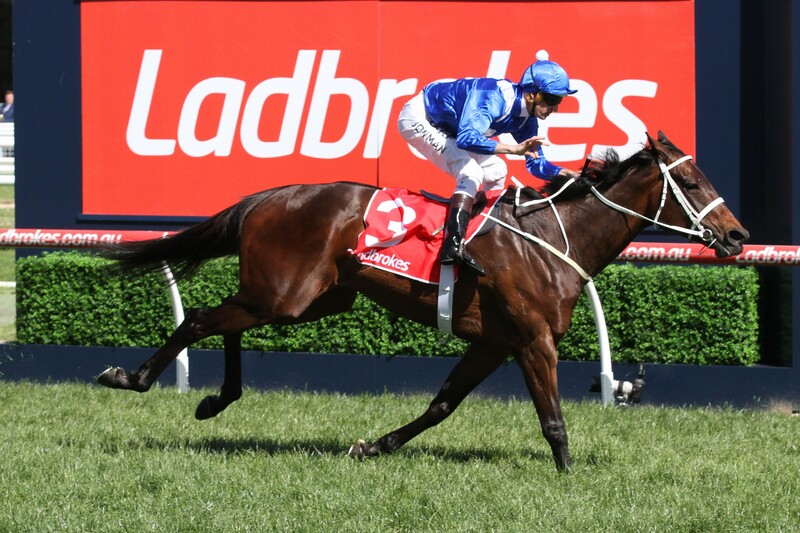 Gailo Chop gave a kick at the top of the straight, but Winx put on the after-burners in the final 200 metres and she finished over the top of her rival! It was fifth time lucky for Who Shot Thebarman as he finished over the top of Zacada to win the 2018 Sydney Cup at Royal Randwick this afternoon. Zacada looked as though he had pinched victory at the massive odds of $91, but Who Shot Thebarman kept finding the line and got his nose down at the right time to record a famous win. Who Shot Thebarman first contested the Sydney Cup in 2014 and had finished second on two occasions before this afternoon’s victory. Alizee stormed down the outside to record a second Group 1 victory in the 2018 Queen Of The Turf Stakes at Royal Randwick this afternoon. Glyn Schofield elected to settle Alizee at the tail-of-the-field, but that proved to be a winning play as she found the best part of the track and savaged the line in the concluding stages. Trainer James Cummings was delighted to see Alizee return to winning form and pleased to finally have some luck after a tough day at the office for Godolphin.